Activa 300 access control is a high performance, cost-effective, wire-free system designed to offer a flexible solution capable of meeting the demands of today’s ever changing working environment. Activa 300 access control delivers a user and environmentally friendly intelligent locking solution that can be tailored to meet the exact requirements of your business. The subtle addition of an Activa 300 product to your door delivers high levels of access control management to you whether your facilities are old or new, small or large. Activa 300 access control can be fitted to glass, metal, timber or a composite material. User friendly management software allows the site administrator to make quick and easy access right changes across single or multiple sites ensuring security and safety is never compromised. Activa 300 Access Control Benefits. Each Activa 300 system is modular and fully scalable, allowing building development and future expansion to be achieved with ease. Our comprehensive range of locking solutions can be tailored to your security needs and budget. Whether installing on new or existing doors Activa 300 is an easy to install, cost effective access control solution. Available in a range of attractive finishes and styles. Activa 300 can include the latest anti-bacterial coating where hygiene is of the utmost importance, eg hospitals and care facilities. Operated using a choice of authorised credentials: a user card, a fob, a wrist band or an intelligent key. The low energy consumption of the battery powered Activa 300 unit (not including the wall reader), makes it an ideal environmental solution. Activa 300 Electronic Handle Set. 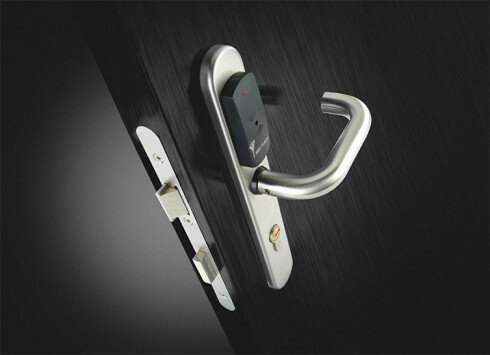 The Activa 300 electronic handle set has been developed to convert a traditional door to an access controlled door. Presentation of a valid card or credential to the integral proximity reader allows regular handle operation to open the door. Suitable for use on internal or external doors and available in a variety of finishes to retain door aesthetics and integrity. Installation of the handle set removes the need for expensive or complicated cabling, thus reducing installation time and limiting disruption to the work place. Once installed the sets can be administered by a stand alone card system through to an all encompassing wireless networked management system. Operation of the cylinder is designed with simplicity in mind. Presentation of a valid card or other credential to the integral proximity reader located on the face of the cylinder allows the user to turn and unlock the door. Converting an existing door to an access control door is as simple as removing the existing mechanical cylinder and replacing it with an Activa 300 electronic cylinder. No need for an auxiliary power supply unit or hard wire cabling, installation can be completed quickly. A full range of application specific lock cases are available to suit your specific door and building needs. The electronic cylinders can be administered by a stand alone card system through to an all encompassing wireless networked management system. Our Activa 300 wall readers are fully compatible on any access control application, for example automated doors, turnstiles, barriers and elevators. Through clever design the proximity readers can be used on new applications or easily replace existing access control readers to become part of the access control management system. Activa 300 access control proximity wall readers can be integrated with other products within the Activa 300 access control range and also used in conjunction with low energy solenoid locks where improved green performance is important. Available as proximity only, keypad only or a combination of proximity and keypad. In addition a slim line proximity reader is available for applications where a discreet solution is required. Activa 300 access control proximity wall readers can be administered by a stand alone card system through to an all encompassing wireless networked management system. Insafe provide a choice of credentials to suit your organisation or users needs. Ranging from a simple user card through to the intelligent key which incorporates your proximity credential within mechanical keys. Furthermore credentials are available in two distinct technologies; HiD iClass and MiFare. HiD iClass is suited to those applications where credential integrity and security is of the upmost importance. It uses a high level of encryption making it one of the most secure credentials available. MiFare technology is one of the most widely used formats available making it ideal for environments where utilisation of existing site credentials is a preference. Cleverly this provides a multi-purpose credential for use with other applications, such as vending machines, parking barriers and other access control systems. Activa 300 Management & Software. We offer a variety of access control management tools that are designed to suit your needs. Administration by management card is the entry level system and is ideally suited for sites requiring only a few doors. 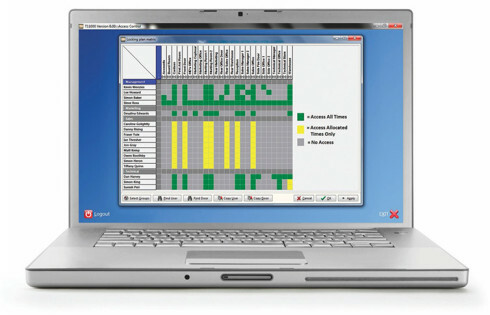 This system allows the manager to locally program a door with the option to add or delete single or multiple users. For those administrators that require more flexibility and greater choice of options, management is available through dedicated software and is available as both an offline or networked solution. In the offline version all programming is done locally at the door with a programming device to change users access rights and retrieve audit trails. The networked option allows the doors to be connected to the software through the local area network without the need to run cabling to the door. This is usually the preferred option for sites that require ‘real time’ monitoring and audit trails, plus the ability to remotely unlock and lock doors from the computer. At the core of the software is the icon lead menu interface designed to allow easy administration of your Activa 300 system.